Poor Dr. Watson. Always the sidekick, never the star. 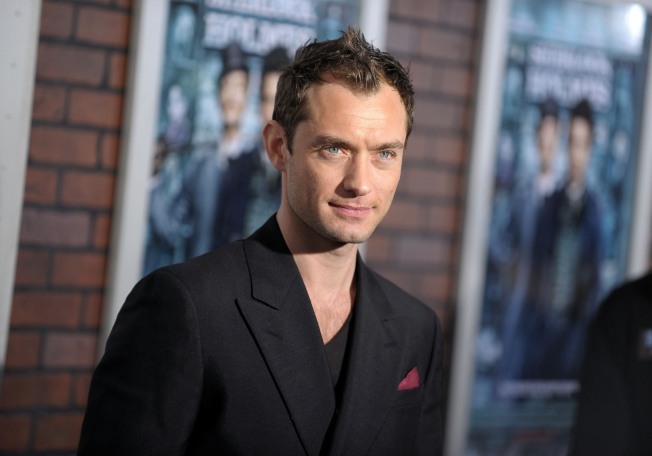 Jude Law hopes to rectify that situation with his charismatic performance alongside Robert Downey Jr. in "Sherlock Holmes," making the detective's right-hand-man a handsome action hero in his own right. He's just not that comfortable with his new nickname: "Hotson." "Mostly I was only hot because I was wearing those thick tweed suits, massive overcoats and hat and gloves," Law said, deflecting the accolade. "I was always the one perspiring on set." Law stresses that the film's version of Watson — a dapper army veteran with an eye for the ladies — is firmly based on the 19th-century stories by Sir Arthur Conan Doyle. Director Guy Ritchie wanted to give the tales a 21st-century spin while staying close to the original material. "There's a reference in one of the books to Watson being very popular with women," Law said. "So that fits." Far from being the bumbler familiar from classic Holmes movies, Watson is a foil and an equal for the detective, and their bickering relationship gives the film a big dose of buddy comedy. "As soon as I knew Guy and Robert were involved, it was clearly going to be a reevaluation of a very familiar duo dynamic," said Law, cheerful and relaxed in an interview to promote the movie, which opens around the world this week. "We were much more interested in creating this equal of two halves, both flawed and both trying to put up with living with each other and both sort of adoring each other but also hating each other." Law, 36, has had an eventful 2009, in which he played a critically praised "Hamlet" in London's West End and on Broadway. He was also in the news for fathering a child during a brief relationship with model Samantha Burke. Law said he was still "slightly shell-shocked" after eight months of "Hamlet," ''of the most remarkable experiences in my life." Meeting Broadway theatergoers reminded him that interacting with the public can be a pleasure. Avoiding the paparazzi is more of a chore. But he says he doesn't let it stop him. "You just live accordingly," Law said. "You learn back routes to an awful lot of places. The glamour is going in through the kitchen and over the back fence."